Hemi power meets TCE Brakes! For years TCE has brought you a host of options starting with the Magnum and 300C. From our simple "Caliper Kits" to a full blown 16" Front kit TCE has you covered. The popular 14" Aero6 kit proved so successful that Wilwood has put it into production and made it a factory kit- saving you some money and adding an all new rear kit to the mix! For the drag racing market TCE offers a front and rear Drag Kit allowing the fit of 15" drag wheels- yet retaining the factory parking brake making this kit suitable for both the street and strip. Check out the options below and see which ones meet your needs! 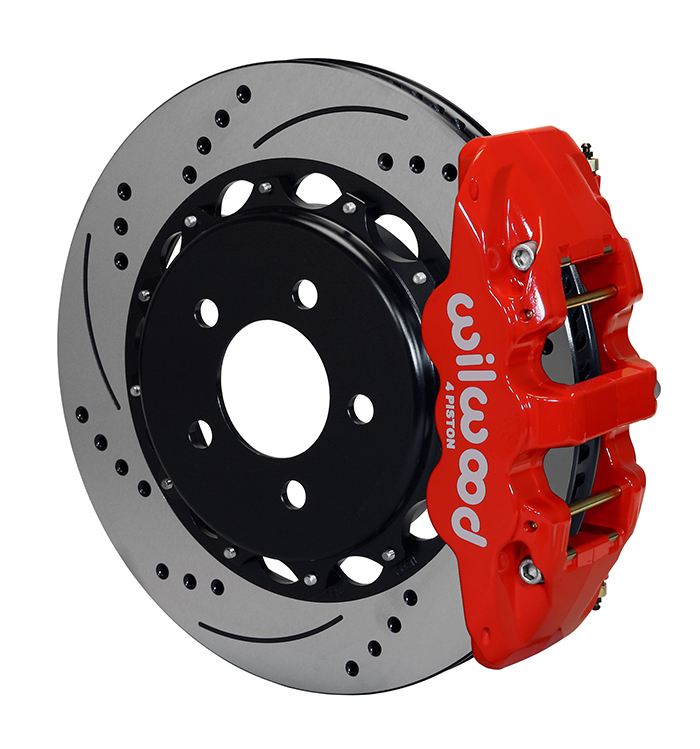 Wilwood 14.25 Aero6/Aero4 4X Kit *Now including AWD! AWD KITS include TCE/Wilwood front kit featuring the same components but TCE produced brackets, alternate aluminum hats and dedicated ss hoses for use on the AWD spindle. Rear kits will ship from Wilwood, Front kits will include TCE shipped product also. Mounting similar to that of the RWD application except the bracket is bolted to the outer side of the spindle and the caliper now forward of center like your stock calipers- not to the rear of the spindle as on the RWD car shown in the SHOW ME and Help me install it links. These kits also off more wheel clerance! The custom nature of this kit makes it more costly to produce. Application: For the Drag Racing enthusiast this front kit offers a profile and low clearances needed to fit many 15" drag wheels, skinnies and slicks! Designed to be a safe daily use/race kit; making it suited for both street and track use. Fit: All factory wheels and many 15" Drag Wheels. *Scalloped rotors for track use only, not safe for street. Application: Available for both RT and SRT application the Aero6 Caliper Kits are a great way to improve brake performance on a budget. For RT owners you can upgrade to 14.2" SRT rotors and our caliper kits for a low cost. For SRT owners you can remove those problematic stock calipers and have a greater choice of easily serviced pads for track use! Fit: Fits both stock RT and SRT wheels or 18" and larger alternates. Notes: Must specify spindle application; RT or SRT, for proper brackets. Must specify if car is AWD. *Late 2013 and up cars have M14 mount bolts we must know if you have this. 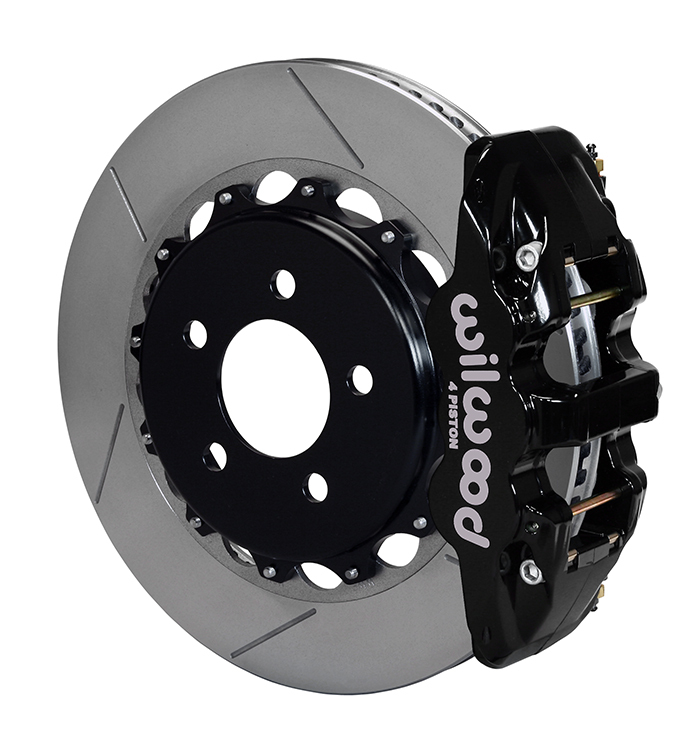 Application: The TCE/Wilwood and Wilwood factory front kits replaces the entire front brake system with their two piece rotors, massive Aero6 calipers and stunning big brake looks. This is the front 'half' of the 4X Kit from the table above. For complete details plese click the various links in that table. Fit: Stock and 18" and larger wheels. Notes: Does not fit SRT. 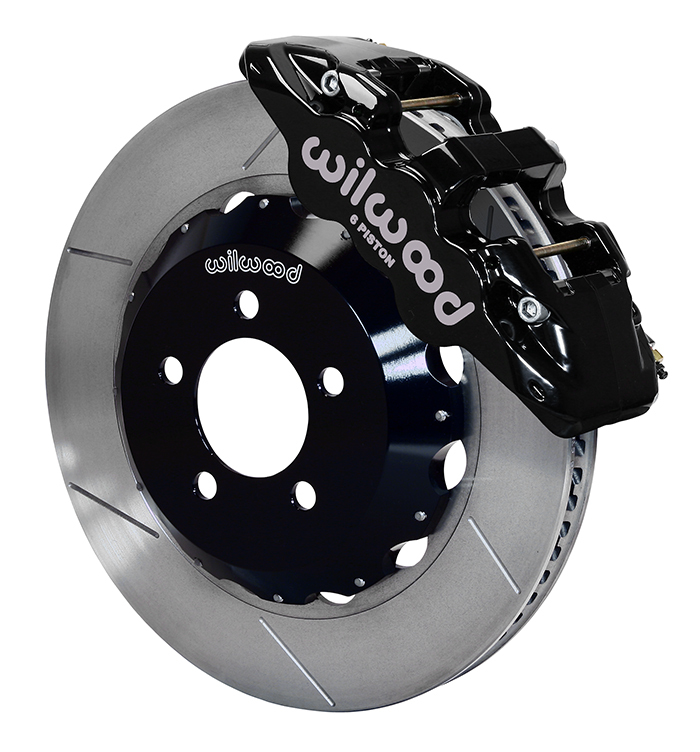 Application: The TCE/Wilwood and Wilwood factory front kits replaces the entire front brake system with their two piece rotors, massive Aerolite6 calipers and stunning big brake looks. This is the front 'half' of the 4X Kit from the table above. For complete details plese click the various links in that table. The AWD kit is specific to the needs of the AWD car due to the use of different front spindles. The calipers are front mounted to TCE brackets, an alternate aluminum hat is used and different ss hoses supplied. Notes: Fits AWD thru 2014. Does not fit SRT. Application: TCE limited production 16" Front Monster Kit. Taking it to the limit TCE combines huge 16" rotors with Wilwood's proven six piston truck calipers for stunning looks and unsurpassed brake performance. Fit: Stock and 20" and larger wheels. Application: For the Drag Racing enthusiast this rear kit offers low profile and low clearances needed to fit 15" Drag wheels and slicks! Incorporating an iron hat our rear rotors retain the factory parking brake making it safe for both street and track use. Fit: All factory wheels and many 15" Drag Wheels. Minimum wheel barrel diameter: 13.7"
*Scalloped rotors for track use only, not safe for street and may allow debris into the parking brake area. By special order only. Allow 2wks build time. Application: Complementing the popular W6A Front Kit this rear kit offers buyers the opportunity to fit matching calipers to the rear of their car and retain the stock RT rotor. Around for a long time this kit increases rear brake effectiveness at a fraction of the cost of complete rear kits! Fit: All stock and 18" and larger wheels. Notes: For R/T only, not for SRT spindle. Rotors not included. Application: New for 2016 this kit fits the same Aero body caliper like our front kit with the larger factory Brembo 13.8" rear discs. Like our popular Aero6 front kit this is a complete bolt on for all RT knuckles and produces a 'hybrid' brake kit of sorts. TCE supplies the calipers, you supply the rotors. Fit: All stock and 18" and larger wheels. Requires use of any stock SRT8 rear "Brembo" style rotor. Notes: Fits AWD. Does not fit SRT. 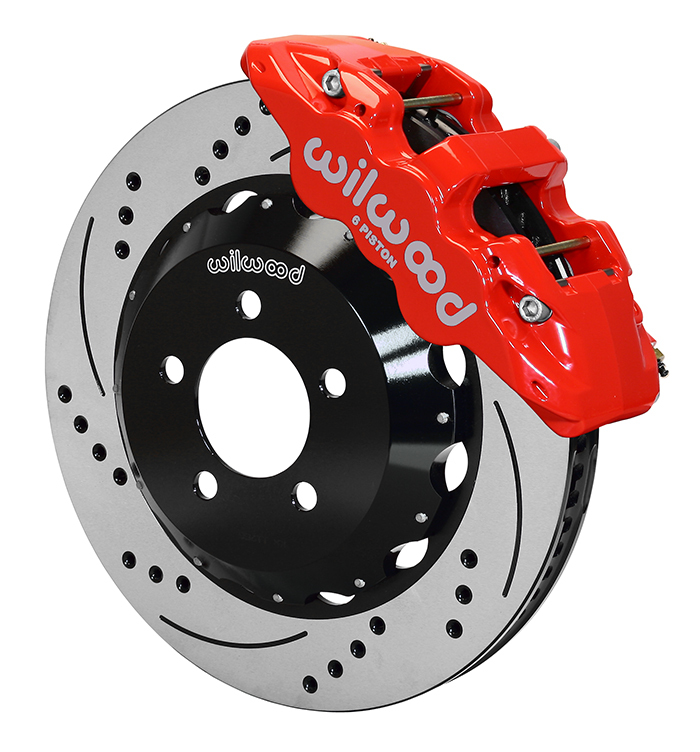 Application: Wilwood's factory rear kit replaces the entire rear brake system with their two piece rear rotors, massive Aero4 calipers and stunning big brake looks.